What to Eat In Ibaraki, Japan	No ratings yet. Experience the Spirit of Samurai with Yabusame, Japanese Horseback Archery	No ratings yet. We are all well aware of how weird Japan can get. From their unique foods to superstitions and not to mention their television game shows. Here’s a question for you, while you were in Japan, have you ever come across any weird buildings or houses? 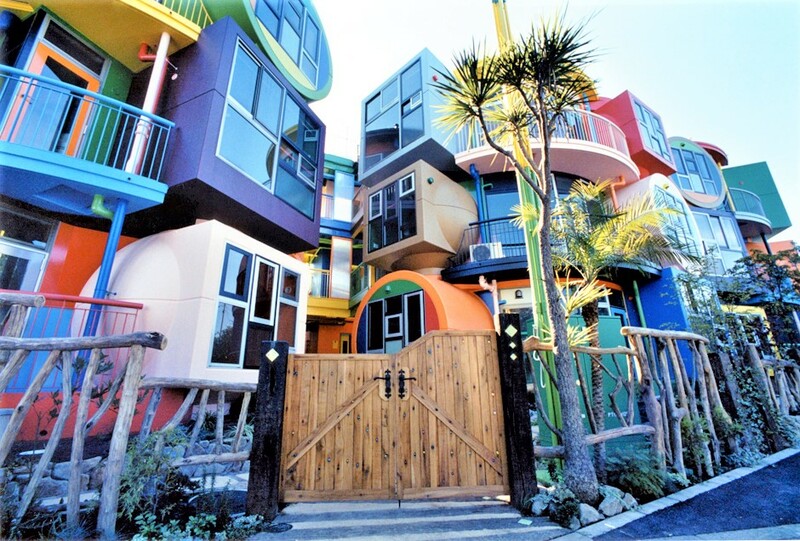 If you haven’t, in this article we are going to reveal to you some of the unusual looking buildings that you can only see in Japan. Let’s start! Many tourists have confused this big and colourful building with the famous Universal Studios Osaka, Japan. Well, who wouldn’t? Truthfully, this building is known as Mashima Incineration Plant or in a simpler explanation, it’s waste management. Yes, over 900 tonnes of garbage were processed per day and it is all coming from Osaka. So, you can only envision on how it would smell like. On the outside, you will also see a 120 meters high blue tower. 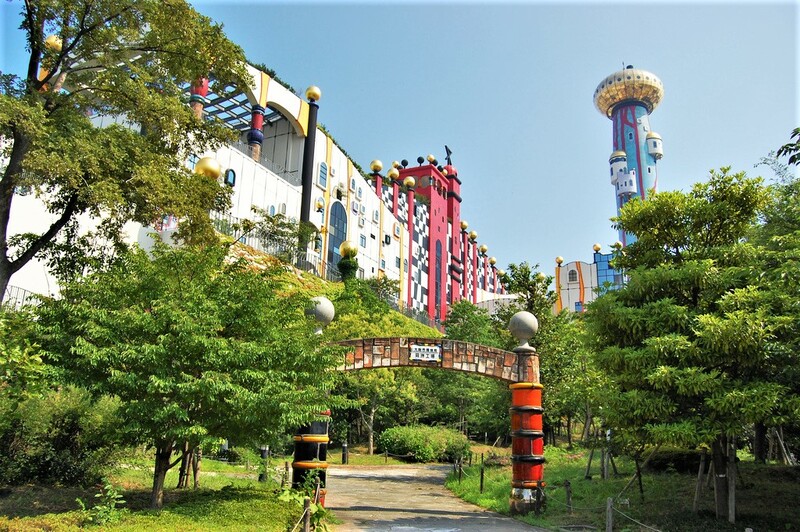 Constructed in 2001 by Friedensreich Hundertwasser, an Austrian architect, he combined Japan’s modern technology with environment and art to design this building. 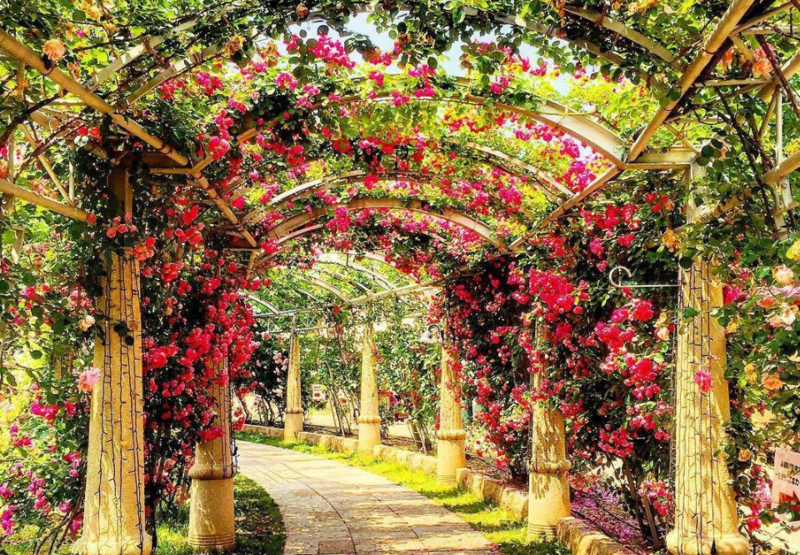 The beautiful structure seems pretty magical especially to children and it is actually assessable for public viewing. You can go on an educational tour inside the waste management to observe how the garbage is being processed and how to preserve the environment. The good news is Mashima Incineration Plant received over 12,000 visitors since its opening, which is satisfying considering the purpose of this facility. Image Source: Myron Akana on Flickr. We have seen a treehouse before, but, what about a tree-restaurant? 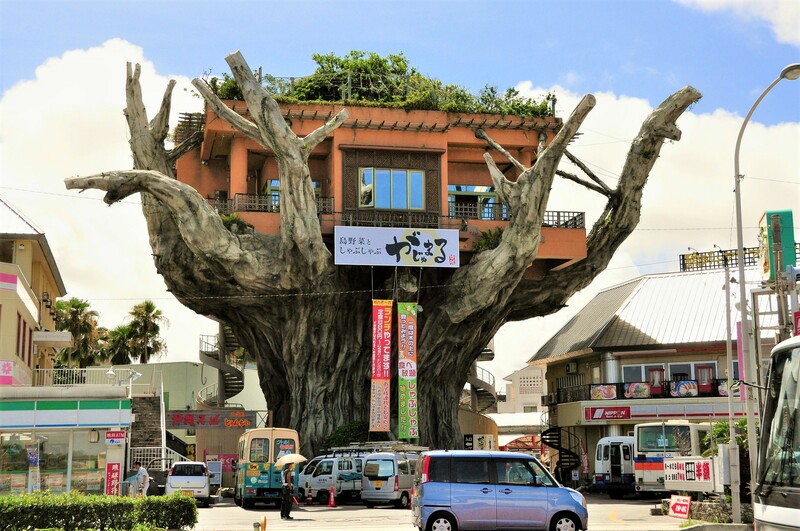 Built on top of an artificial banyan tree, this restaurant looks like it was being hand-held by those branches. Previously, it was known as ‘gajumaru’, which means banyan tree. Then, they changed to Naha Harbor Diner. Presently, the diner was closed down due unknown reasons. During its glory days, to get up to the restaurant, guests need to take an elevator or climb the spiral staircase. It’s very interesting when you get to dine on top of a tree right in the middle of the street of Okinawa. Image Source: Flavor Wire on WordPress. 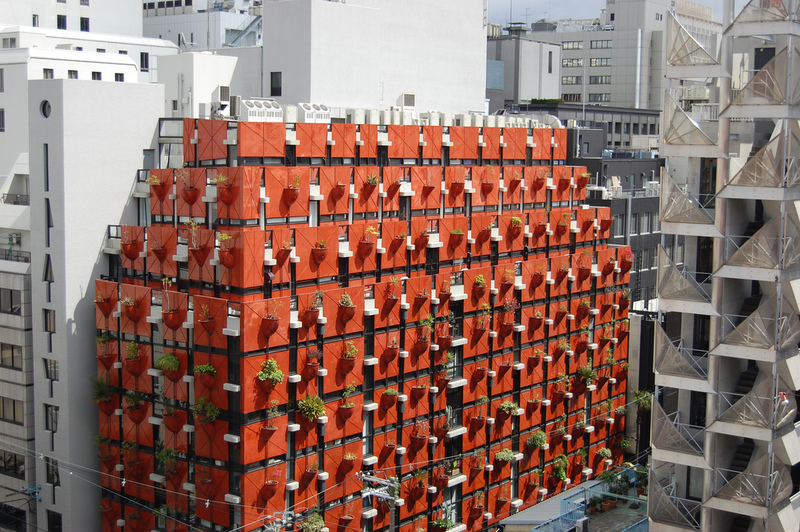 This striking orange building is known as Organic Building which was an idea from an Italian architect, Gaetano Pesce. This building existed about 20 years ago and each tile has their own plants. Over 80 types of trees were used to fill up the blocks and it is managed using red tubes to ensure that there is no drainage. 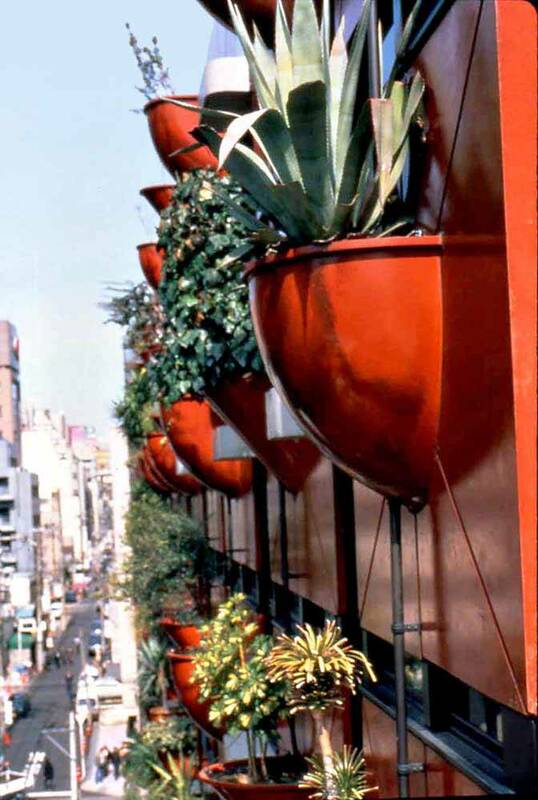 This nine-storey building was constructed with a purpose to be an upright garden right in the middle of the city. This unconventional looking structure will definitely capture anyone’s eyes as they walk around Tokyo City. 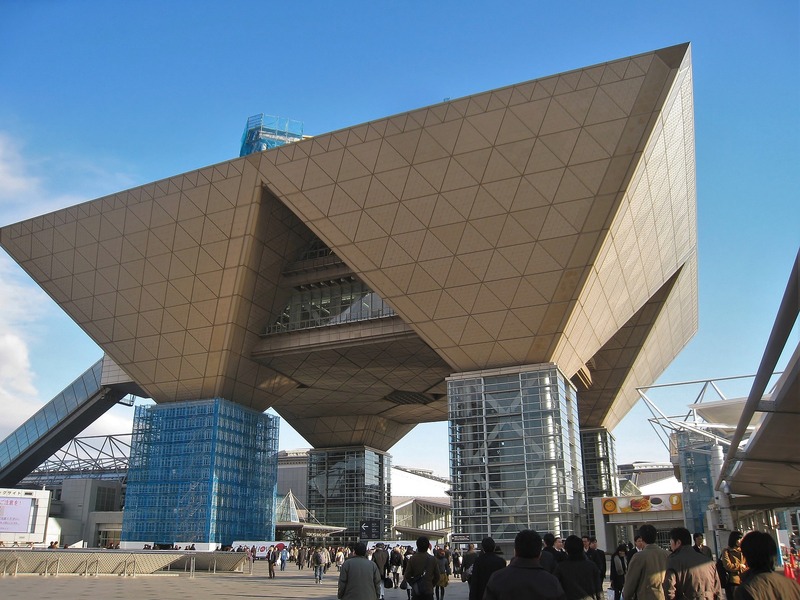 Tokyo Big Sight or formally known as Tokyo International Exhibition Centre is a combination of both convention and exhibition spot where you will see many contemporary arts installed inside and outside the building. As you can see, the structure is shaped like an inverted pyramid with a strong foundation on each point, thus, making it very unique. Many events such as anime festival and conference are held here as it contains several halls that are able to accommodate a large number of audience. Inside, there are many dining options which are very costly compared to other restaurants in Tokyo and filled with many of Tokyo’s latest art expo. Other than that, sometimes, there will be a massive projection mapping and light displays reflected on the structure that will blow your mind away. 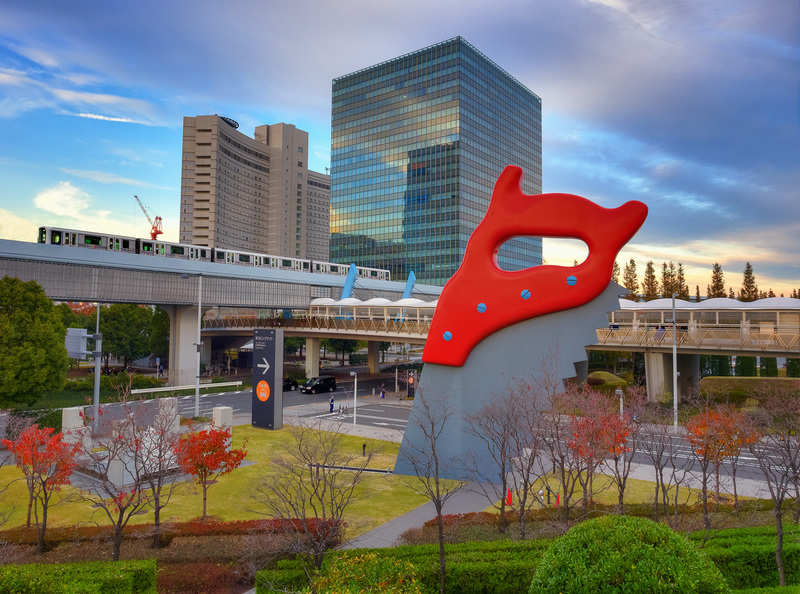 In addition, as you make your way to Tokyo Big Sight, you will notice a huge saw sculpture buried deep in the ground near the lawn. This is one of the artworks you will see throughout the place. Image Source: Reversible Destiny Lofts Official Website. 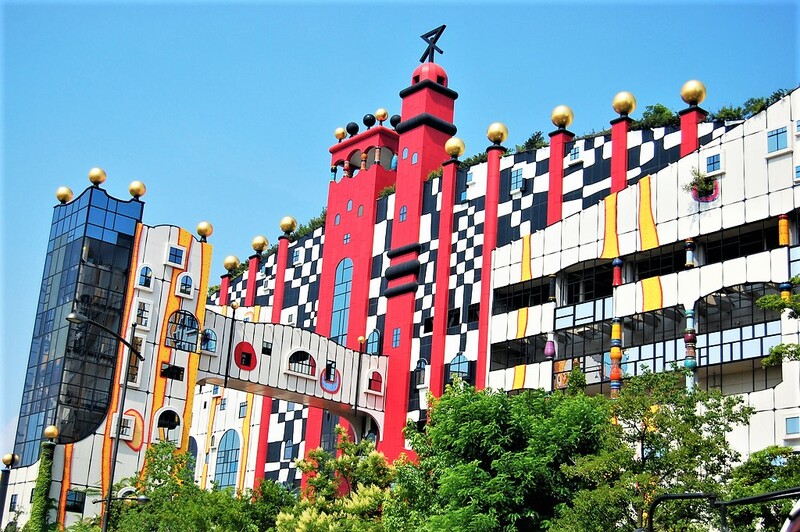 This multi-shaped and multi-coloured building is a residential unit that receives many guests since it was first opened. 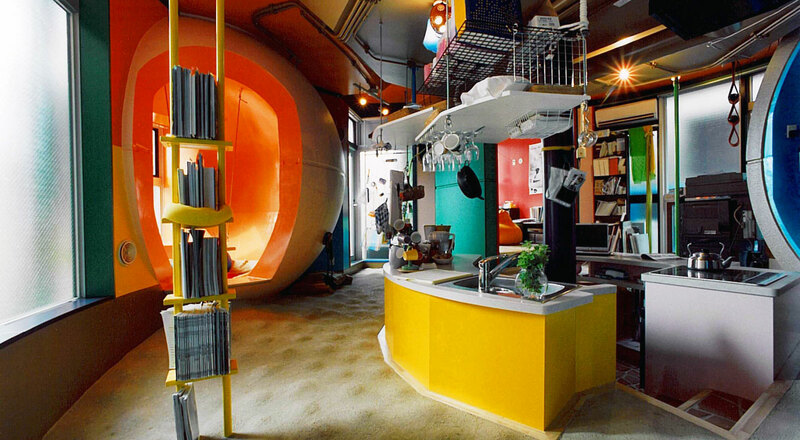 You can actually stay in these weirdly shaped lofts as it provides accommodation to those who would like to live in this one of Tokyo’s weird building. Completed in 2005 by two renowned architects, Shusaku Arakawa and Madeline Gins dedicated the lofts to the late Helen Keller (American politician and activist) due to her special ability to reverse destiny. Reverse destiny in this context refers to how Helen Keller was able to contribute so much to the society with her little abilities, given the fact that she was a deaf-blind woman. Therefore, visitors will fully use their ability to explore some of the spaces that were designed to suit only children or elderly groups. 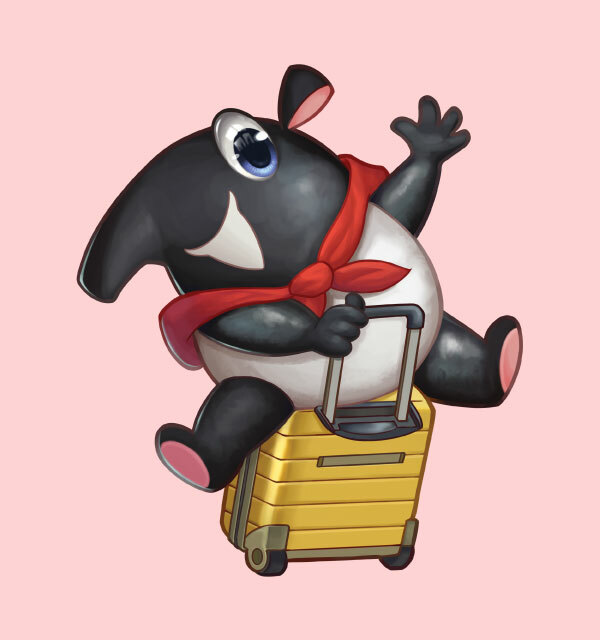 Throughout this place, you will encounter many odd spaces and structures, for instance, uneven floors, hanging furniture and colourful sphere-shaped rooms. Overall, these lofts don’t actually contain any enclosed spaces. It is like a wide spreadsheet of nothing but shapes. With three buildings in total, you can book to stay at this reversible lofts by checking out their website. 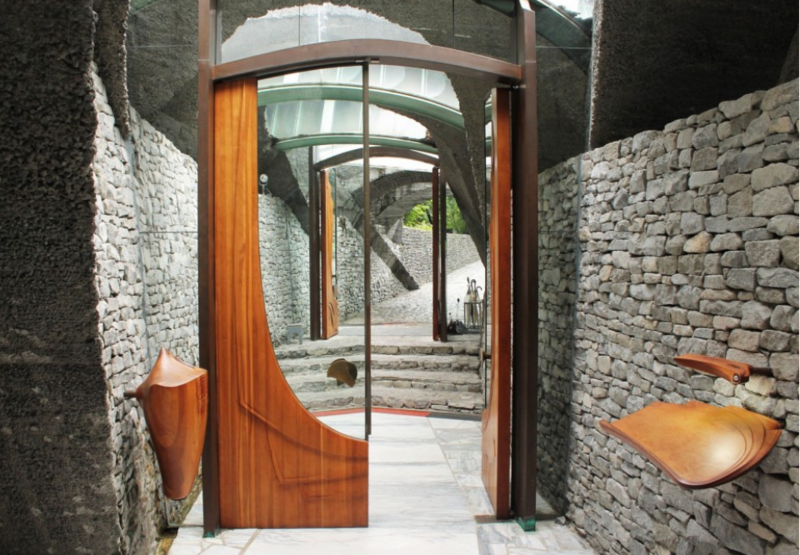 These two architects also described this place as ‘the undying residence’. Aerial view of the chapel. Image Source: Arch Daily. From the roof, we can only envision what it actually looks like based on the asymmetrical design. This is the work of Hiroshi Nakamura & NAP and led by Hiroshi Nakamura himself. He did The Ribbon Chapel and Optical Glass House, both in Hiroshima which is absolutely stunning. 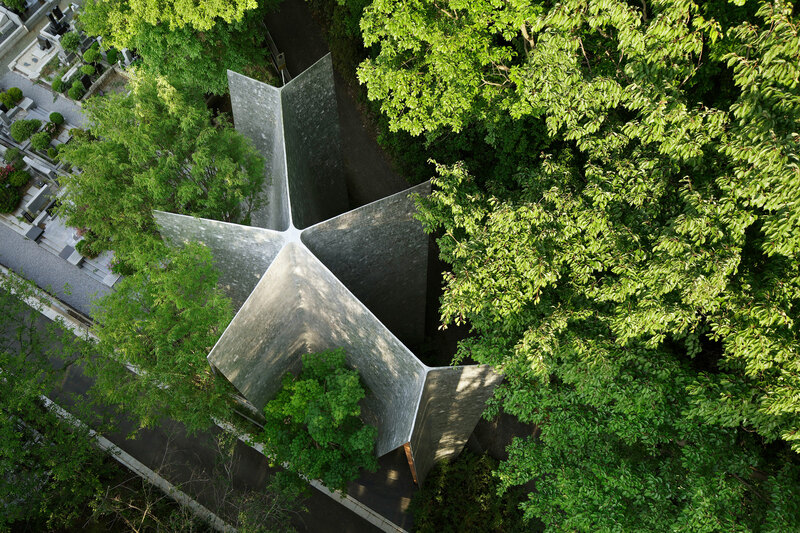 Opened in 2013, the chapel quickly gains recognition the following years when it won numerous awards and the 2016 ARCASIA Award for Architecture “Building of the Year”. 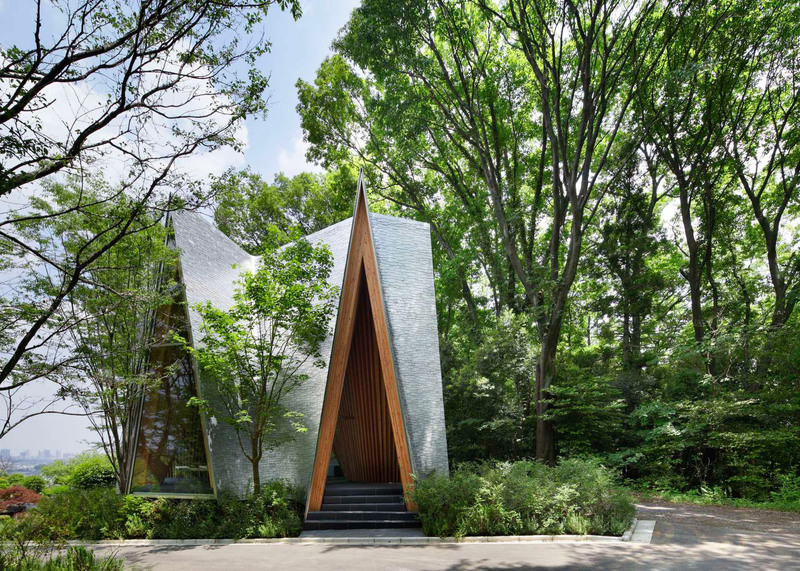 Hiroshi Nakamura mentioned the idea behind this chapel was to create a place as people pray, so does the architecture. 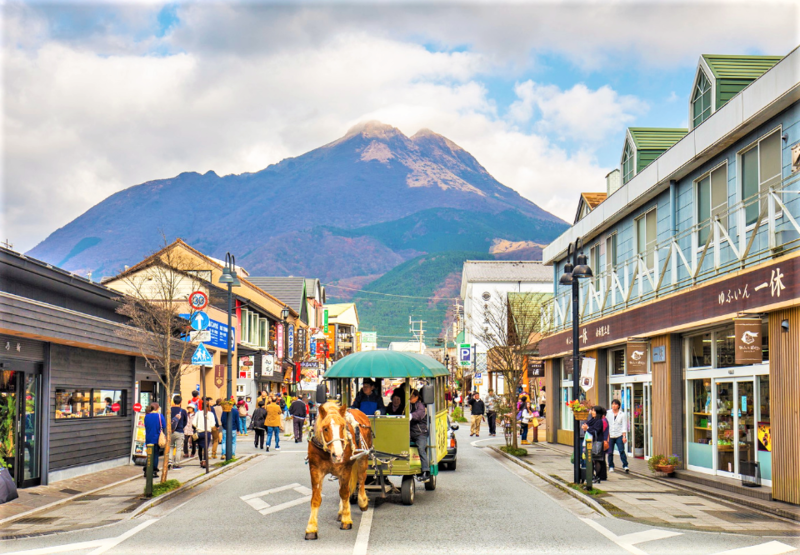 This can be seen where the building is shaped using Gassho-style like in Shirakawago. The chapel symbolizes two hands touched together to pray. Inside, you will see Japanese larch wood beams connected from the floor to the roof to blend in with the natural surroundings. 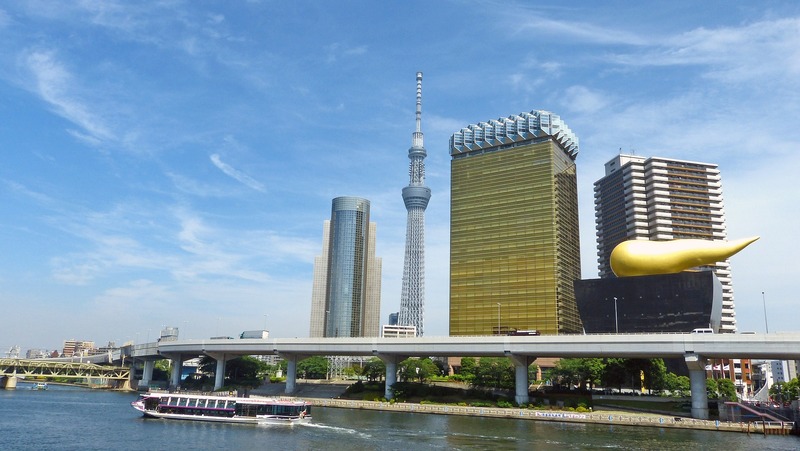 We’re pretty sure those who have visited Tokyo have seen this golden tadpole-shaped structure before. This golden thing can be viewed from Sumida River and it is situated on top of local beer brand called Asahi or also known as Super Dry Hall. Invented by French furniture designer, Philippe Starck, this golden thing is also called ‘Flamme d’Or’ which means flame of gold in English. Other names to signify this object is ‘Golden Turd’and ‘Poo Building’. As strange as it sounds, visitors can enjoy Asahi beer at a lounge located on the 22nd floor of the tall building next to the Flamme d’Or. If not, you can just stare at this weird-looking structure from afar. To Ghibli fans, this is one of the top spots you should visit in Japan. 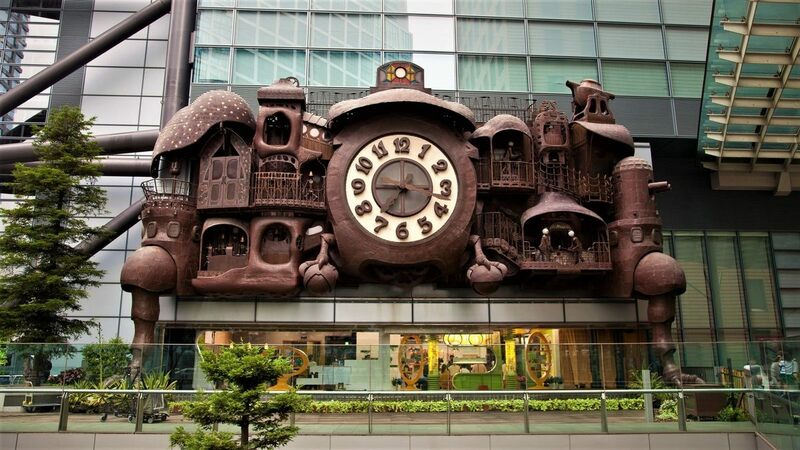 In Tokyo, this giant steampunk clock catches the eyes of most visitors that pass through this area. Hayao Miyazaki designed this clock and got the inspiration based on Ghibli original animated film, Howl’s Moving Castle in 2004. 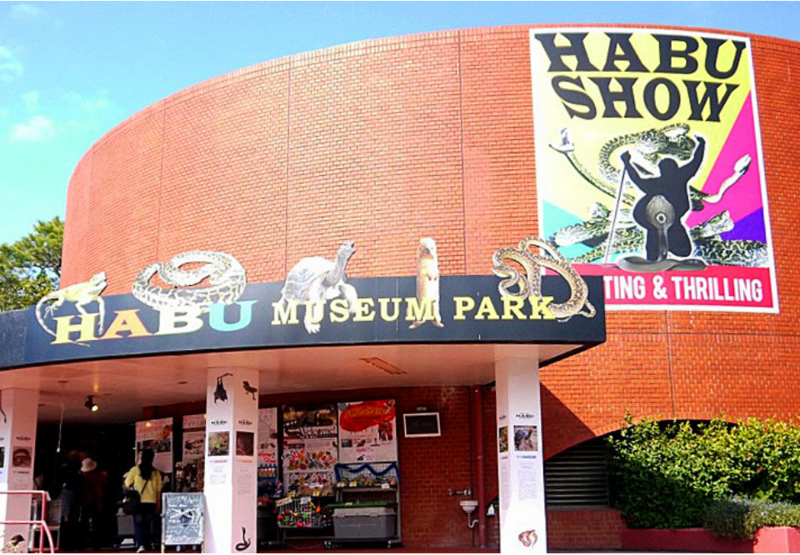 Also recognized as Nitele Big Clock, grab the opportunity to witness special magic shows every week at 12PM, 3PM, 6PM, 8PM and an additional time slot at 10PM on weekends. All the characters you see on this clock will be re-enacted during these hours. What do you think of these unusual buildings? Weird or normal?